Algol, the demon star, is a good target for October. The winking eye of Medusa, this is an eclipsing binary that goes from an easy second magnitude star to a near fourth magnitude star that can be hard to spot in urban skies. Evening observers in the eastern time zone can see the star fade from view on Oct 13 and Nov 2. Morning observers get their best views on the 16th and 28. You can check timing for your location using the tool from Sky and Telescope. 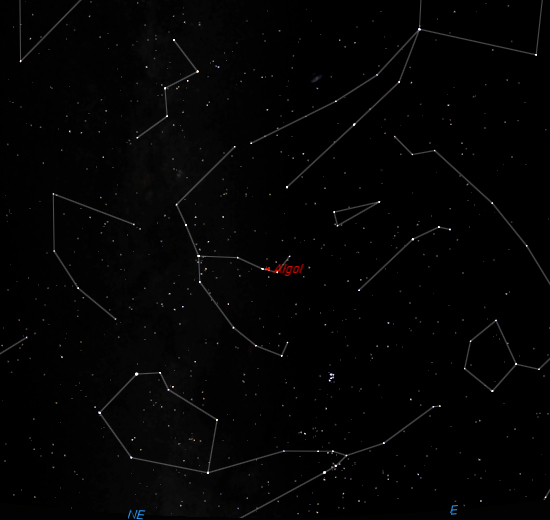 Looking ENE at 10 PM on Oct 16, when Algol should be dim and difficult to see. If the weather cooperates, this will be a great astronomy weekend! As I mentioned in my earlier post on observing this month, the Orionid Meteor shower peaks this weekend. This weekend is also a first quarter Moon, which means by the early morning hours the Moon has set, and the skies should be nice and dark. The Orionids tend to be an extended shower, with plenty of meteors for several days on either side of the peak, so going out in the pre-dawn hours any day from today through early next week is good. This is especially good if you live someplace like SE Michigan, where the weather has a tendency to turn bad almost every evening (darn those great lakes, always evaporating!) According to a NASA Science News post, the peak will actually be early Sunday morning. Orion will be due south around 5 AM Sunday, so find an observing location with a clear view in that direction. If you’re up for watching into the twilight hours, Venus rises about 6:30. She’s so bright she’s easy to spot even when low in the sky, where she looks like an airplane or even a hovering UFO. About the same time that Venus rises, Algol should start into eclipse on Sunday morning. Unfortunately, astronomical twilight also begins around that time, so it may be hard to tell whether the star’s disappearance is due to the eclipse, or the sky brightening. If you want to plan for an easier Algol minima, try this S&T article on this very ghoulish star. This weekend is also Astronomy Day. Many clubs and outreach organizations have special events. If you’re in SE Michiagan, and the weather is clear, head to the Kensington Metropark Nature Center between noon and 4 for solar observing (also, something about a clown, some raptors, and a rock wall you can climb.) More info on Roscoe and the Raptors at the Metroparks website. If you’re not in SE Michigan, take a look at the Night Sky Network’s calendar of events. Here is a very nice tool I’ve been using for years to find out if I should watch Algol on any given evening. Algol is an eclipsing binary star. The dimmer star of the pair blocks the light from the brighter one about every 2.6 days, so it drops quite a bit in brightness on a regular schedule. It’s very cool to see Algol go into minima, especially in light polluted skies where the star disappears. In Ann Arbor, it basically goes from just about as bright as the Big Dipper stars to gone in a fraction of an hour. At first, you’re not sure it’s any different, so you go look at something else. Then you look back for it, and you can hardly find it. Wait another 10 minutes, and it’s gone. Not to worry though, it’ll be back in about 4 hours. The times in this app are mid-eclipse, so start watching 2 to 2.5 hours before the time listed, or watch of it’s return beginning 1.5 – 2 hours after mid-eclipse.